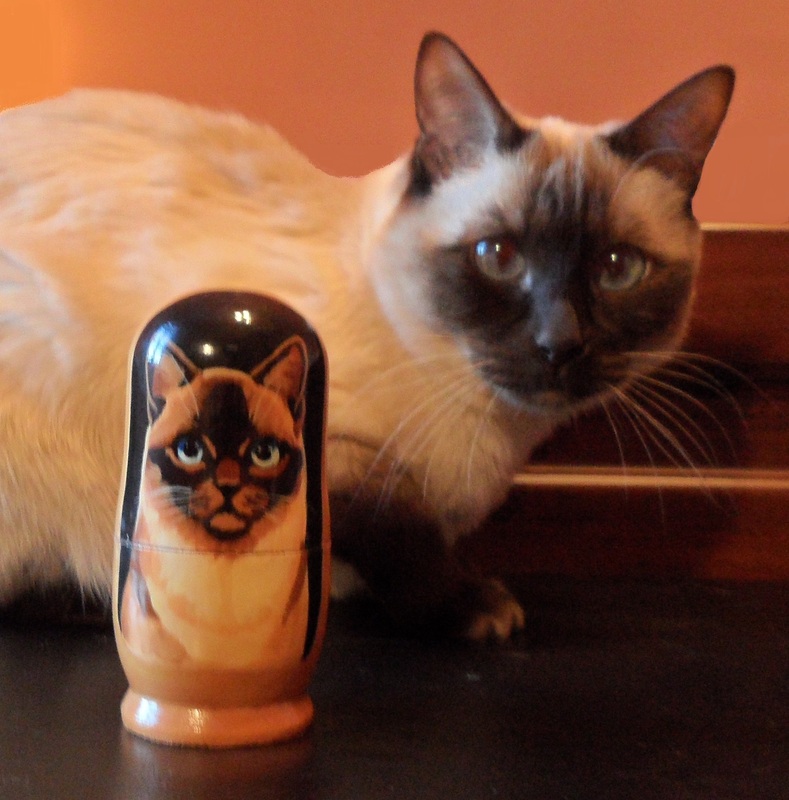 To end my February matrioshka series, here is a ‘catrioshka’ alongside a member of our family, Moonshadow. He logged stories about the Iraqis using children to fight US forces (he found this was untrue); Iraqi troops waving white flags and then attacking US troops when they stepped out to talk to them (almost certainly untrue); Iraqis wearing US uniforms to commit atrocities which would be blamed on the Americans (untrue); Iraqis ambushing US marines on the road to Baghdad (he found the marines had been attacked repeatedly by a US plane); Iraqis shooting prisoners of war (claimed personally by both George Bush and Tony Blair, later said by Downing Street to ‘lack absolute evidence’) … In each of these cases, Gardiner tracked back and found that the falsehood had been fed into the media by ‘official sources’ of one kind or another. Herman, Chomsky, and Davies list a number of causes of this phenomenon, including: concentration of media ownership in a few hands; economic pressures which have reduced the number of real journalists; increasing necessity to produce news rapidly; and a resultant over-reliance on government press releases. This allows state leaders to set an agenda, after which journalists will generally follow it, without challenging the basic narrative. Rather than holding political elites to account, the mass media become in effect a willing accomplice. Gratov’s description of the relationship between the Russian state and media fits this model. First, he says, in the 1990s, media owners sought subsidies from the state, in return for which they provided political support to Yeltsin’s government. This created ‘a deliberate intermixing of journalists with the political and economic elite.’ Second, the post-Soviet mass media were from an early stage ‘controlled by a small number of industrial finance groups.’ The owners of these groups are closely linked to the Kremlin, which exercises control informally through the personal relations between the politicians and the media moguls. This ensures a form of voluntary compliance of the media in spreading the state’s message. We should not imagine that these distortions are improvised by a team in the Presidential Administration, seconded to manage the news on Channel One or Russian TV and Radio. … A distinguishing feature of the New Censorship is that it encourages journalists (the word should probably be in quotes) not only to serve up the news agenda they are handed by the Kremlin, but also to creatively embellish it. In other words, nobody is making Russian journalists report what they do – they elect to do so themselves, as unwitting participants in the system of government manipulation. This is not so very different from the critique of the Western media made by Herman, Chomsky, and Davies. Likewise, the parallels between concentrated media ownership and an overly close relationship with the state in the West and Russia are obvious. In addition, Gratov divides the Russian media into three types: those outlets and publications which are ‘foes’ of the Kremlin; those which are ‘friends’; and those somewhere in the middle. As far as the first of these are concerned, ‘From the outset of the 2000s … there was no point in asking foes to do the Kremlin any favours, or to ask them to refrain from doing something. With then, as with the Western media, there was either a brisk, business-like relationship or no relationship at all.’ This is quite an admission, for what it says is that the government leaves opposition media alone. It doesn’t censor them, or otherwise try to influence them. They are free to publish what they like. This is not at all a ‘restoration of the Soviet system’, as Gratov describes it. Clearly the relationship between the state and the media in Russia leaves a lot to be desired. There is a lack of genuine accountability, and the state is able to shape the news agenda in its favour. But it isn’t obvious from Gratov’s report or from any other analysis that the dynamics are that different from those in the West. That final quotation, it seems to me, summarizes perfectly the reason why there is a war in Ukraine. A statement by Lieutenant General Sir Adrian Bradshaw, Deputy Supreme Allied Commander Europe. According to Bradshaw, “the threat from Russia, together with the risk it brings of a miscalculation resulting in a slide into strategic conflict, however unlikely we see that as being right now, represents an obvious existential threat to our whole being.” Sadly, this kind of crazy hyperbole is now so mainstream that nobody bats an eyelid when people in senior positions say it. Two reports published this month by a neo-conservative British think tank, the Henry Jackson Society: one on the subject of censorship in the Russian media, to which I will return later this week, and one on the alleged danger of Russian ‘soft power’. Multiple witnesses have pointed out to us that Russia’s policies are based on long-standing threat perceptions, historical grievances and issues surrounding Russia’s identity. Such perceptions are shared by many of the Russian people and parts of the Russian elite as well. It is important that these perceptions should be better understood in the West. The third in my February series of matrioshkas is this one with 30 pieces. The smallest is about one millimetre wide. Yet even it has a little face on it. Before coming up with solutions it is first advisable to determine the nature of the problem. Right now the United States is considering sending arms to Ukraine, while here in Canada the Defence Minister, Jason Kenney, has been mulling the deployment of Canadian soldiers to train the Ukrainian Army. But is a lack of arms or training the real reason for the Ukrainian Army’s defeats? To answer that question, it is worth looking at what has been happening in the town of Debaltsevo, where a large Ukrainian contingent, possibly several thousand strong, was encircled by rebel forces. The government in Kiev has repeatedly denied that its troops were surrounded, but even Ukrainian military journalists acknowledge that the main road out of Debaltsevo is in rebel hands and that troops of the Donetsk and Lugansk People’s Republics have captured most of the town, as well as a substantial number of prisoners. On the night of February 17-18, a large part of the garrison escaped through gaps in rebel lines, but Ukrainian sources report heavy casualties in the process. Substantial quantities of equipment have been destroyed or have fallen into rebel hands. Ukraine has suffered a serious defeat. How did the Ukrainians end up in this mess? The answer is not a lack of weapons. They had plenty in Debaltsevo and the surrounding area. Nor is a lack of training to blame. For sure, the Ukrainian soldiers are not as well trained as those of Western armies, but neither are the rebels. The evidence suggests that those surrounded in Debaltsevo fought bravely and for the most part effectively. It is not the fault of the soldiers that they were encircled. Rather, it is the fault of Ukraine’s highest level political and military leaders. The rebel plan to cut the supply lines to Debaltsevo was no secret. The rebels proclaimed it openly. Moreover, their plan did not succeed instantaneously, but took several weeks. The Ukrainian high command had plenty of time to withdraw its troops to safety long before it did. Instead, it buried its head in the sand and repeatedly denied that there was a problem. Reports suggest that during the recent peace negotiations in Minsk, President Poroshenko of Ukraine and President Putin of Russia spent many hours arguing over whether Debaltsevo was encircled. Poroshenko insisted that it was not and claimed, therefore, that no provision was needed in the peace settlement for the withdrawal of Ukrainian troops. After the agreement at Minsk was signed, the rebels offered the Ukrainians safe passage out of Debaltsevo. The offer was rejected. Ukraine’s leaders had the opportunity to save their men, but they did not take it, incorrectly believing that they could still hold onto the town. They could not. Many lives were lost unnecessarily. This is not a unique occurrence. Last July, Ukrainian soldiers were similarly surrounded in a zone which the rebels called the ‘southern cauldron’, a thin corridor about 60 kilometres long south of the cities of Donetsk and Lugansk. Again, this disaster was not only predictable but predicted. As early as the start of July, the Ukrainian General Staff warned of a coming ‘catastrophe’ and suggested that the army abandon the sector in question. It was overruled, the troops were surrounded, many were killed, hundreds more surrendered, and large quantities of equipment were lost. In short, Ukraine’s defeats are the result of dismal leadership rather than a want of weapons or training. Unfortunately, Western countries’ obsession with Russia has deluded them into thinking that Ukraine’s problems are entirely the fault of Russian malevolence, and has blinded them into ignoring the role played by the Ukrainian government’s incompetence. To date, the policy of Canada and its allies has been to change Russian behaviour by means of sanctions. But Ukrainian behaviour also needs changing: in particular, Kiev has to abandon all hopes of military victory and face the reality that it must negotiate directly with the rebels in order to enact the constitutional reform required in the latest Minsk agreement. Our influence on Russia is very limited. We do, however, have leverage over Ukraine, and can hope to change its behaviour. Rather than giving unconditional support, we should start trying to effect that change. 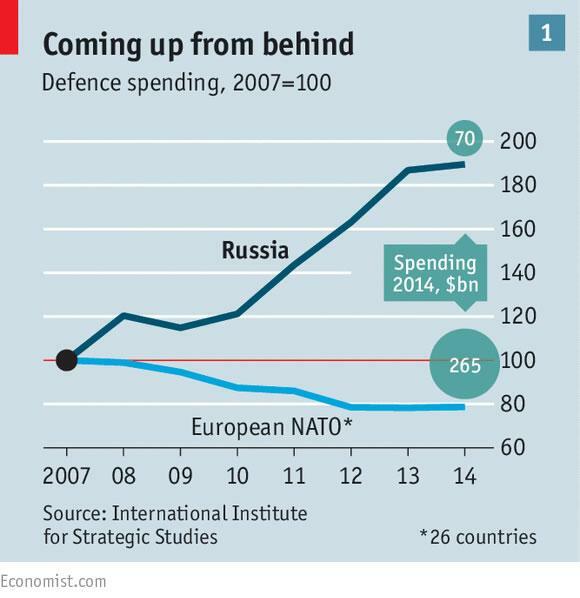 This graph from The Economist, which I spotted on the Lawyers, Guns, and Money blog, shows that European NATO members spent almost four times as much on defence last year as Russia ($265 bn as opposed to $70 bn). If one adds the United States ($640 bn), NATO defence spending is around nine times that of Russia. Yet the graph manages to suggest that it is Russia which is threatening Europe. Be afraid!